CSD Imaging Supplies, Inc. is an international distributor of O.E.M. printer, fax and copier supplies. CSD Imaging Supplies is headquartered in Bartlett, IL, a suburb of Chicago. From our two distribution centers, one strategically located just outside Chicagoâ€™s Oâ€™Hare International Airport, we have the capability of shipping container loads of product anywhere in the world. No order is too large or too small for us to fill. We have enjoyed meteoric growth by maintaining our dedication to our customerâ€™s bottom line. A combined 30 plus years of experience in the O.E.M. supplies marketplace fuel our success. Our global buying power coupled with an ever-increasing domestic and international demand for our services has enabled us to take advantage of favorably priced product opportunities in the market. We in turn pass those savings on to our customers. Look to CSD for all of your imaging product needs including O.E.M. 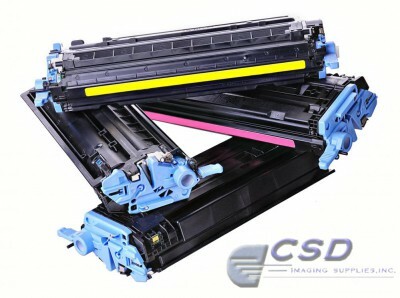 laser, fax and copier toner, as well as ink jet cartridges. We carry name brand products such as Canon, Lexmark, Samsung, Panasonic, Konic Minolta, Brother, Apple and Hewlett Packard to name but a few. We welcome the opportunity to quote you on these products in addition to any other large volume opportunities you may have. We pride ourselves in suppling the latest in digital imaging equipment. Copyright © 2015 CSD Imaging, Supplies, Inc.